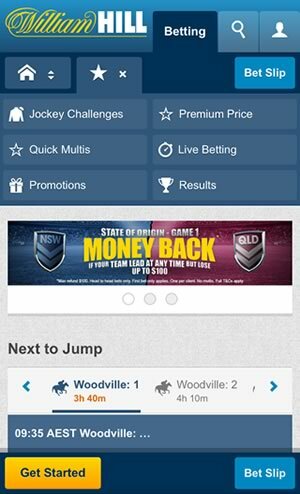 William Hill Australia is a mobile sports and horse race betting app developed exclusively for the Australian market. Bet on Australian Rules or the Melbourne Gold Cup from your iPhone, Samsung Galaxy or Microsoft Lumia. William Hill Australia is a new company that was formerly known as SportingBet. 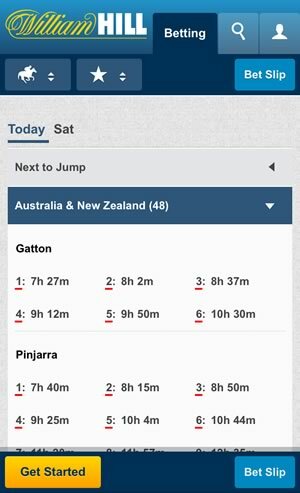 The app was developed exclusively for Australian horse racing and sports fans. Covers the AFL, NFL and every other major Australian and global sport. Bet on horse, greyhound & harness racing from Victoria, New South Wales etc. Wide range of mobile betting options available on mobile. William Hill is one of the highest profile sportsbooks in the world. They are currently in the process of bringing their mobile betting to the masses and their latest venture comes in the form of their Australian sports betting app. The app itself is specifically targeted towards the Aussie punter, and with this brings a host of features and sizeable welcome bonuses for their users. Throughout this review we will be looking at what makes the app tick and arguably more importantly, if it’s set up in a way that will target the Aussie betting public to suit their betting needs. The app has a very familiar look and feel to it for those of you accustomed with previous William Hill products. For those who aren’t, then what you get is a well designed and more importantly, clean looking betting app. The homepage includes very little clutter and the top nav bar will make you aware of any promotions that they are currently offering. This doesn’t take up too much of the screen though and never feels as though it’s in your face, which is good! Horse racing and Australian Rules are your two main sports from within the app and these markets can be accessed quickly within the top nav bar. The button for ‘All Sports’ can be found at the right hand side of the header where a drop down menu will allow you to access these if you wish. The homepage does allow you to place quick bets on upcoming horse races, which is a really nice little feature. The odds will be displayed for the upcoming events and then you just simply click the bet you want to place. Alternatively, you can also click the market here and you will be taken into the segment for that event. The main two sections will include events that are taking place right now. You simply click on this event and then the right section will give you a run down of all the betting markets for this game. What you will find is that each game includes a really good mix of markets on offer. The profile of the game will depend on how many you can bet on, with higher profile events giving a much deeper range than something that is lower profile. The depth of markets is something that, as a William Hill user, you are able to take of advantage of. 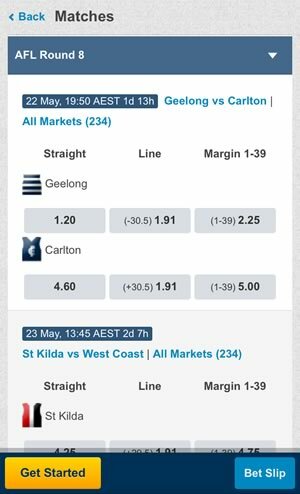 Whilst the app is very much designed and targeted to the Australian bettor, it does still pull markets and sports that are likely more popular from elsewhere. 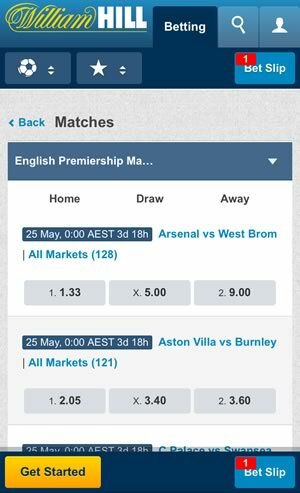 For example, the app includes a load of markets for Aussie Rules games, but along with that they also include a similarly impressive amount of soccer markets, even though the sport is not as popular in Australian compared with say, the UK. The app also allows you to access the massively popular William hill stats section. For this you can access dozens of sports and from there, hundreds of statistical markets for each. It’s one of the best in the industry in terms of quantity of data, but it does load up outside the app in your browser, which is a bit of negative for us. 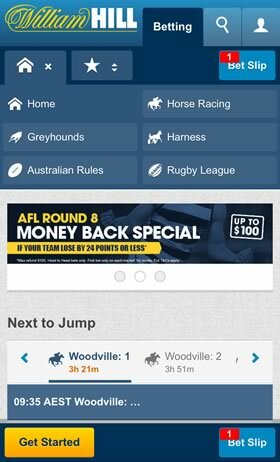 As an Aussie punter, you aren’t going to find too many sports betting apps that come close to William hill in terms of depth. The company have been going for decades and over that time they have found what works and what doesn’t, before then implementing that research. The design of the app is pretty simplistic and should be familiar to those of you who have used William Hill products in the past. But, even for those of you who are possibly using the William Hill brand for the first time, then you aren’t going to have any issues. Coming up with negatives for the app has been very difficult. If we had to point out something it would be the number of links that actually load outside the apps. We mentioned about the stats section earlier, but things such as promotions, help and the blog all come with an outside link meaning you may have to reload the app to get back in.